A blog about fungi, science, and art. What’s the use of Xylaria? I used to answer these questions by saying no, there aren’t any Xylaria that are eaten or used medicinally, but they are nonetheless interesting because of their ecology, their evolutionary history, and their diversity. It turns out, I was mistaken on both counts! Alan Bergo (left), and Anthony Michael Blowers both enjoy Xylaria polymorpha, the classic north temperate dead man’s fingers, with beef tartare. Alan Bergo, who writes the excellent food blog Forager Chef, has been eating Xylaria polymorpha for quite some time now, not just on steak tartare, but also other things. He says he likes them shaved raw on something warm—like a bowl of noodles—which helps release their flavour. Alan describes it as having a “fine, mushroomy flavor”, which was “very pleasant, if mild”. Read his post about it (and see more of his lovely gastronomic photography) here. Alan’s adventurous consumption is inspiring others, like Anthony Blowers (who took the photo above right). We don’t have Xylaria polymorpha here in Oregon, so I have not had the chance to try this yet. I probably will, when I’m next somewhere that the fungus is common, although I don’t think I’ll be eating large quantities of this fungus anytime soon, given the variety of complex and bioactive chemicals that the fungi produce. Xyloketals isolated from a mangrove-associated Xylaria. The first five were described for the first time in this study, and 6 was previously know, but also isolated. 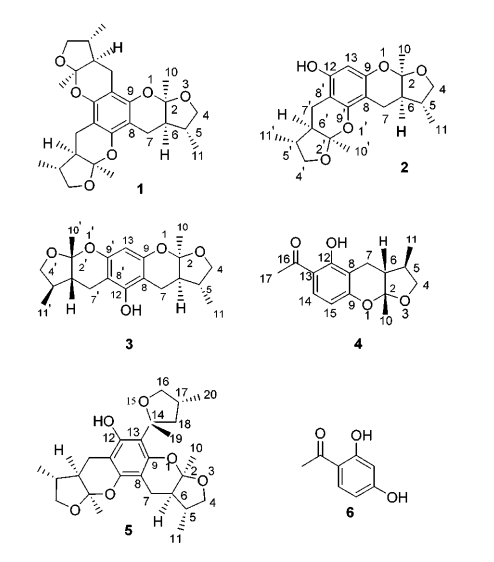 Figure from Lin et al., 2001 (linked above). 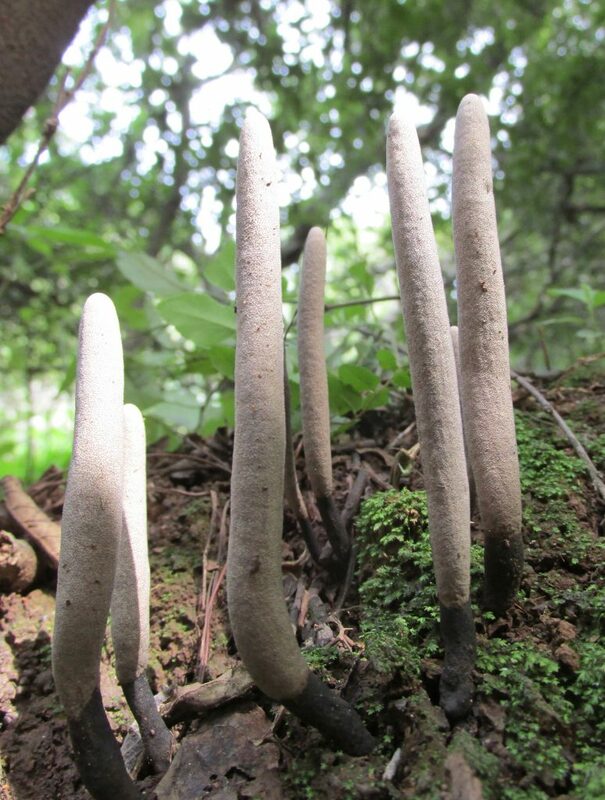 Which brings us nicely to the second question: are Xylaria used medicinally? It turns out, Xylaria nigripes has been used in traditional Chinese medicine for centuries! This is a Xylaria belonging to the monophyletic subgenus Pseudoxylaria, which are exclusively found associated with termite nests — they compete with the fungus that the termites cultivate, fruiting out of combs from deep underground. Photographed by Liz Popich, this Xylaria from the subgenus Pseudoxylaria was fruiting out of an abandoned termite mound in South Africa. Xylaria nigripes looks much the same as this unidentified Pseudoxylaria — like most species in the genus, X. nigripes is most readily distinguished by spore size and shape using a microscope. In traditional Chinese medicine, a preparation of powdered mycelium of this fungus, known as Wuling Shen in these contexts, is taken several times a day for sleep regulation, depression, and anxiety. You can even buy it on Amazon (although given the lack of regulation in the supplements industry, I’m not sure how much rare, termite-associated Xylaria you’d get in that bottle; it’s a lot like buying Cordyceps online — caveat emptor). It’s still pretty poorly studied, but there have been a few clinical trials with it, as well as a number of animal model studies. Interestingly, despite being typically marketed primarily for sleep regulation, most of the clinical trials have focused on depression. Xylaria nigripes is included in this interesting review of traditional Chinese medicine treatments for depression; the consensus seems to be that there’s evidence that it works. One study that stands out as being particularly sound methodologically (which is not always the case for studies examining ethnopharmological formulations) focused specifically on treatment of depression in epilepsy patients. Using a double blind, randomized, placebo controlled study with just over one hundred participants, they found that Xylaria nigripes does, indeed, relieve depression as compared to the control. The caveat is that the fungal treatment and the placebo didn’t differentiate until the 12th week of treatment: depression is one of the things with really strong placebo responses, as well as something that generally responds slowly to interventions. I wish this study had gone on longer: I’m really curious what the long term effects may be. Adding to a the few small clinical trials, there are a handful of animal model studies. These add some convincing data to the pile, because they tend to be a bit more mechanistic, and less prone to subjective measures. A particularly interesting one used a rat model to examine the effects of Xylaria nigripes extract on REM-sleep deprivation induced memory impairment — basically, they kept a bunch of rats up late and then made them swim to a hidden platform. In general, it takes the rats a lot longer to find it when they haven’t slept, but if you give them extract of X. nigripes, they find it a lot faster than if you don’t! And then they mashed up the rats’ brains so that they could examine changes to some potential target proteins with and without sleep deprivation. Without sleep, there’s a big drop in the amount of a particular protein (p-CREB, phosphorylated cyclic-AMP response element-binding protein, which is involved in a lot of interesting neural signal pathways); giving the rats X. nigripes recovers levels of that protein, hinting at possible molecular pathways that might be involved in its function. All this is really hopeful sounding for this traditional Chinese remedy to actually be functional and useful, but a word of caution is necessary here. Not all of the work that’s been done on wuling shen has had such positive outcomes. A multicenter study out of Wenzhou Medical College in China, which included almost two hundred patients, examining the use of X. nigripes to treat insomnia (the primary thing it’s advertised for) found no difference from placebo across their study. We should be cautious in our evaluation of how effective such treatments are, and examine all of the available data carefully. I, for one, am hoping for more large-scale double-blind studies with this fungus, as well as detailed chemical studies to examine which secondary metabolites are the ones that have a meaningful therapeutic effect. It has been suggested that one path forward for funding taxonomic work — and chemotaxonomy and drug discovery have great potential to walk hand in hand — is to “work with the devils”, and use wealthy pharmaceutical companies to maintain funding in the face of declining funding rates from governmental granting agencies. Such a route will be full of pitfalls and roadblocks and ethical quandaries, but would certainly be better than no funding for taxonomic work at all. Really, it comes down to the recognition that basic scientific work has the potential to be of benefit: either the public recognizes it by providing public funds, or companies recognize it by providing private funds. I fear for the openness of science when more funding is coming from private sources with private interests, but that is a discussion for another time. Very interesting read! Here is another “use” I found for Xylaria not too long ago. Oh yeah! Thanks for the reminder: that’s a pretty cool story! I’d been wanting to go back and find the original research for that to read: no I shall! This blog explores the intersection between art and science through the lens of mycology; the love of fungi in general, and ascomycetes in particular; and the ways that gender interacts with society, particularly in the academic sciences. Mark Richman on Xylaria: What, where, how? Roo Vandegrift on Xylaria: What, where, how?